Sorry, but I have to shout it out. Artichokes are wonderful. I’ve been eating them for as long as I can remember…and this recipe is the reason why. My great-grandmother (Dad’s maternal grandmother), otherwise known as Big Grandma, brought this recipe over with her from Italy when she came to the US. I was fortunate enough to know Big Grandma for a long time – she died while I was in college – and for the most part, she wasn’t able to do much cooking since she suffered from Parkinson’s starting at an early age. Fortunately, this recipe has passed on through the next 3 generations…soon to be 4. It’s easy, and delicious, and one to try to convert the artichoke naysayers (how dare they???). What are your thoughts on artichokes? Using a bread knife, cut the top of the choke to level it. Cut stem off. Peel stem and reserve to put in pot when cooking artichoke. With kitchen scissors, cut the sharp edges off the leaves. Mix parmesan cheese, raisins, pignoli nuts and bread crumbs with some pepper. Spread the leaves on the chokes and stuff with mix. One way to do this: stand the choke in a separate soup bowl and hollow out the center where the thorny leaves are…put a very generous amount of the mixture on the center cavity, spread the leaves and push the mixture into the leaf area. Using a pot tall enough to cover the chokes and cover, place the chokes in, fill with water and some olive oil to cover the bottom of the leaves (about a third of the way up the artichoke). Drizzle some additional oil on top of each choke. Bring water to a boil, then reduce to a simmer. Cover the pot and steam the chokes for approximately one hour. Pull a leaf and taste for tenderness. If you like it more tender, steam longer. 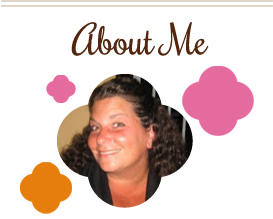 This entry was posted in artichokes, family, Italian, pignoli, side dishes. Bookmark the permalink. 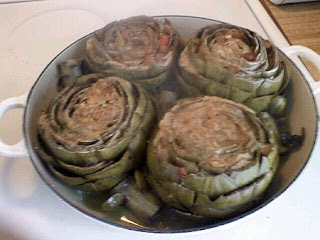 My mom used to make artichokes just like these! I haven’t had them in forever but they were always one of my favorite dishes of hers. We love artichokes but I have never tried cooking them at home. Maybe I will try this. We actually first had them on our honeymoon in Italy, so yummy! This looks absolutely delicious. the stuffing is wonderful and the sentimental value is immeasurable! I only learned a few months ago how wonderful artichokes are. I haven’t tried them stuffed, yet, though, but I’ve been meaning to try. A recipe that has passed down so many generations is definitely a keeper. Thank you for sharing it. My mother’s family originating from the Casserta area of Italy always made stuffed artichokes with a ground meat – basically a meatball mixture – then stuffed between each leaf and on the top in the cavity… then they poured a plain tomato sauce on top (like a Hunts if you don’t want to make one….) added a little water to bottom, then simmered on stove for hours in a covered pan…then basting with juices from bottom of the pan periodically and adding water as necessary… the absolute best you have ever eaten…the salts from the artichoke mix with the sauce and the meat making a flavorful sauce, the meat absorbs this flavor as well… It is amazing!! by the way this recipe sounds great – will definitely try it – but will probably have to make a batch of my mom’s as well!! or my family will be very unhappy! What are “Pignoli” nuts please? They’re the same as pine nuts.